The new and completely redesigned website offers visitors new visual features and easy access to essential information to enhance the user’s experience and better understand HTT's solutions to reduce pollutants. Our new site makes it easier for customers to understand our solutions to reducing VOC's, methane and other pollutants. On December 31, 2017, HiTemp Technology LLC (HTT) unveiled a completely redesigned and rebranded website at hitemptech.com. The website was a highly-anticipated project and is expected to provide users a clean, uncluttered design that incorporates improved functionality and enhanced content. The new site has been optimized to ensure visitors are provided a "user-friendly" experience across all digital devices, including desktop and mobile. It has a clean uncluttered design, improved functionality and enhanced content. "We are excited about our new website launch and the robust information it provides for customers to better understand HiTemp Technology’s superior solutions to reducing VOC’s, methane and other pollutants," said Stephen Parker, HiTemp Technology’s Founder and President. "We believe that this new site will allow our visitors to have a very informative experience as we continue to grow." Technical data and videos work together to provide a detailed overview of HiTemp capabilities across a wide range of solutions, including rotary kilns, thermal catalytic oxidizers and enclosed flares. HiTemp Technology’s website will be regularly updated with news on our latest installations and industry advancements. The new look and feel will better provide updated information and resources to our prospects and clients. We invite visitors to explore http://www.hitemptech.com to experience the redesigned website. You can also connect with HiTemp Technology LLC on Facebook and LinkedIn. HiTemp Technology (HTT) is proud to be celebrating our 35th year in business. 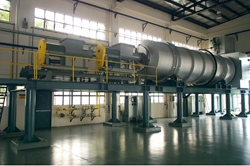 HTT is a leading designer and manufacturer of custom, high-temperature catalytic oxidizers, fume incinerators and thermal oxidizer systems featuring enclosed flares and rotary kilns to control methane gas emissions for eco-friendly industrial applications. HTT’s customers include manufacturers that need to safely dispose of solvents used in their production processes, pharmaceutical firms that need to handle exhaust emissions and municipalities that need soil remediation and want to generate energy from solid waste. Our Catalytic Oxidizers typically weigh one-fifth of what comparable RTO (Regenerative Thermal Oxidizer) systems weigh and can often be roof-mounted. We offer the industry’s only 5-year Limited Warranty.